After years of tinkering with ideas of swapping “white blocks” into his previous 760 project cars dubbed daily drivers, Chris Wiita of Los Angeles, CA finally found the perfect victim. 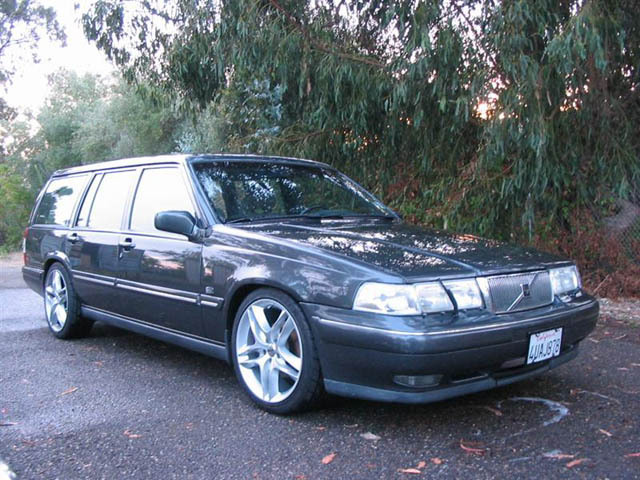 A pristine 1995 965 was selected just over a year ago to be revamped as a monstrous 6cyl B6304, turbocharged and Megasquirted example of Volvo’s performance potential. When all is said and done, this beautiful charcoal grey metallic wagon will most likely take the podium as one of North Americas most innovative and captivating 960s ever constructed. Right off the bat a set of 18x8” Ronal wheels were mounted to offset the standard first impressions of what seems to be all Volvo station wagons followed by the meticulous task of normal maintenance and other repair to restore the car to “stage 0”. 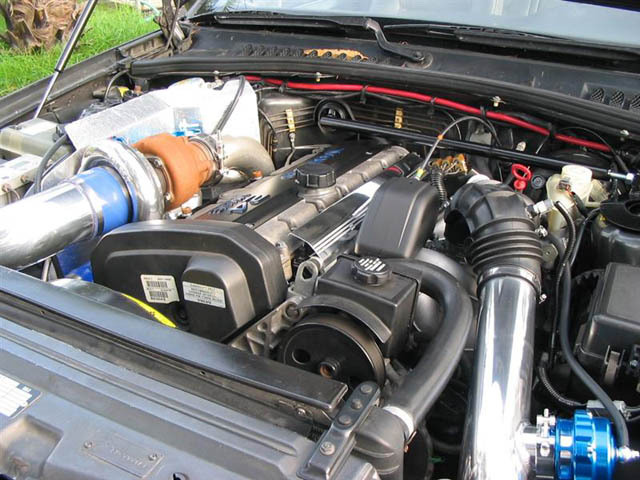 Starting the project based around the fact that a Holset HX35W turbo was to be the center attraction, consideration for the underlying components associated with turbo-charging a normally aspirated vehicle was taken into account. Along with forced induction comes the need to supply adequate fuel and more importantly, fuel control. In keeping with the Turbobricks tradition of “build-it-yourself”, Chris opted for a Megasquirt'n'Spark-Extra management system firing 46lb CFI injectors fed by a High Pressure 255LPH Walbro fuel pump. A water/alcohol injection system is being added to the equation that will be controlled by the extra management portion of the MS as well. To withstand the additional abuse a B&M oil cooler was added to the stock AW30-40LE transmission monitored by an Autometer temperature gauge mounted in the dash. Unfortunately the transmission control management ties directly to the OEM Motronic ECU for shift signals – something the Megasquirt task force has yet to include in their design. 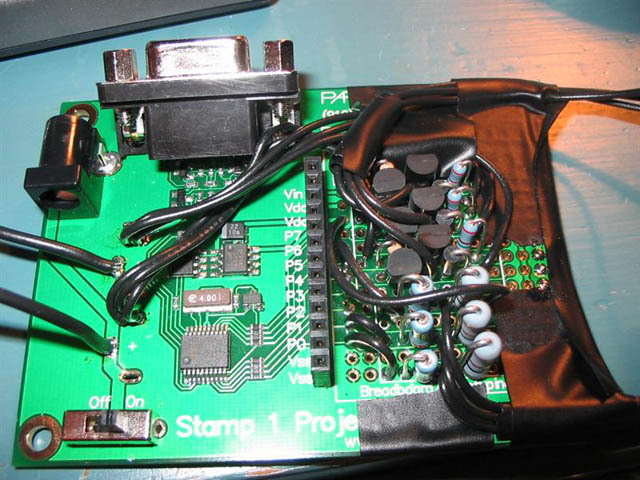 As a full-time mechanical engineering student of UCLA, Chris was able to outline and construct his own output circuit to control the electronic transmission through the use of shifter paddles (much like one would find in rally, formula, Ferrari, etc). The home-made control unit interfaces directly with the shifting solenoid on the transmission through Chris’s own code and a Basic Stamp microcontroller with two activation switches - each with a custom aluminum paddle mounted to an inline skate wheel bearing. The circuit board and internals are currently being molded into the steering wheel to be hidden from the ambiance of the blue and white LED lit interior. 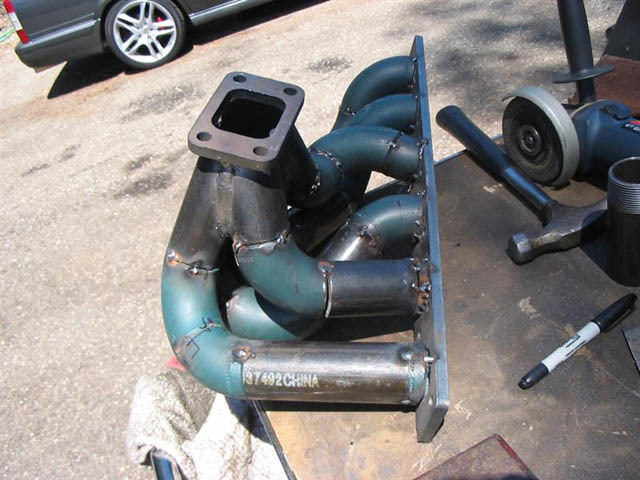 The manifold and mounting position of the turbo was outlined utilizing Solidworks CAD software which proved to be helpful come time for cutting and welding. Choosing the top mount option (aside from its thermal advantages) allowed for additional space to include a Tial 38mm external wastegate and the 3” downpipe. After hours of piecing together weld els’ and fine tuning the fitment of the collector the manifold was ported, coated and the freshly polished turbo was mounted. Due to the tight fitment an engine brace was installed to prevent the wastegate from hitting the strut tower and heat shielding was installed both on the inner fender as well as under the hood above the turbine. The front airdam and bumper assembly was cut up to fit the rather large bar & plate style intercooler measuring in at 24x12x4”. 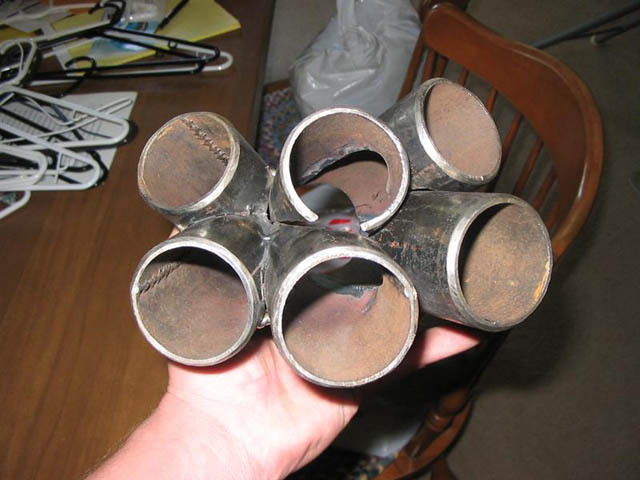 The attached 3” intake piping was cut to size and a custom dye set using a bench top vise was fabricated to roll a coupling bead into the ends of each piece. Additionally a 50mm Tial blow off valve was TIG welded into place and attached with a v-band clamp. Currently Chris is outlining the suspension upgrades as its current cut springs and stock shocks wont hold up to the torture for very long. A set of coilovers will most likely be built for the front and rear as well as custom fitting IPD swaybars to the independent suspension. Following the mechanical fine tuning the interior will be upgraded including some better seats and a full complement of AutoMeter Cobalt gauges. Future plans involve acquiring a second block to be built up with forged internals to accommodate boost levels that will surely send poor Chris chasing driveline failures for months... but hey, that’s just par for the course! 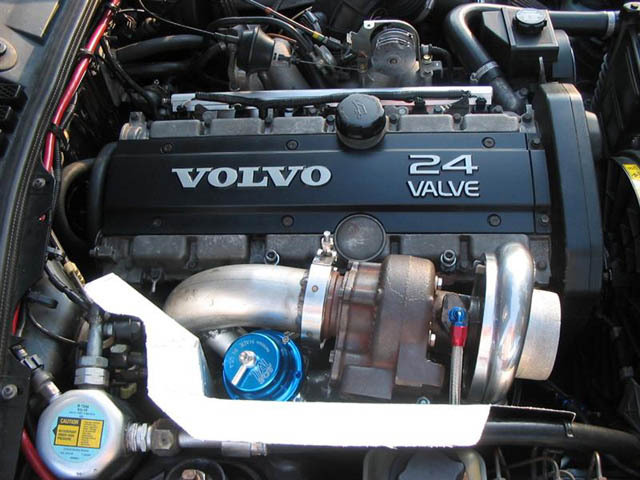 Motor: Volvo B6304 3.0L n/a 6cyl white block fed by a Holset HX35W turbo 12cm² housing and custom manifold. Megasquirt (MSnS+E) and 46lb/hour CFI Injectors. Tial 38mm external wastegate, 3" downpipe and exhaust through a Dynomax Ultra-flo muffler. 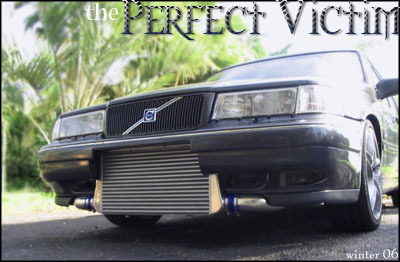 A 24x12x4" bar and plate intercooler and Tial 50mm Blow off valve with 3" intercooler piping. 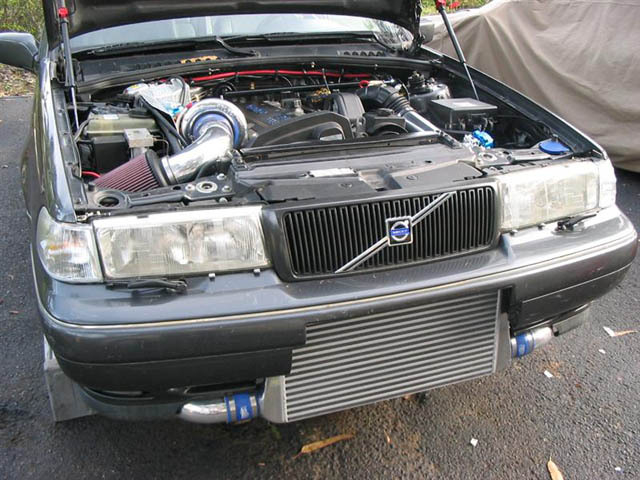 Transmission: A stock Volvo AW30-40LE with a B&M Transmission oil cooler and a completely custom paddle shifter control unit. Suspension: Stock springs cut down 4 coils resulting in close to 4.5" drop all around. All the front suspension components have been cleaned and coated black. Currently using the stock struts from Monroe and Nivomat self adjusting shocks with the independent rear suspension. Wheels & Brakes: 18x8" Ronal RT Twin wheels mounted with Kumho Ecsta MX 225/40-18 series tires. Brakes are painted stock calipers with EBC Greenstuff performance pads. Cosmetic: Aside from the rather large chunk missing from the front airdam and bumper assembly, the European side marker lenses and a good wash and wax, the car is essentially OEM looking. 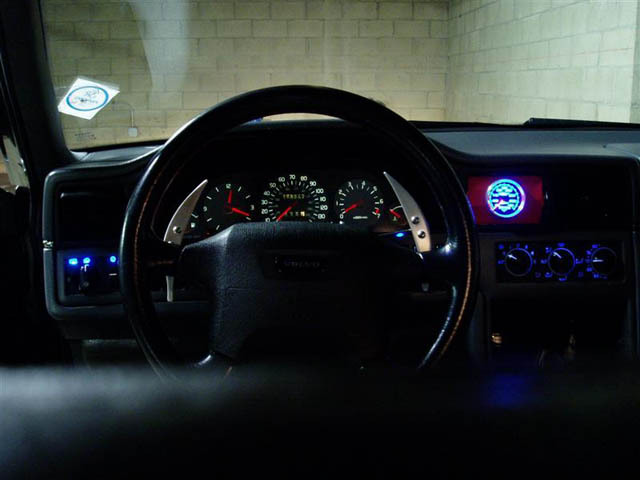 Interior: The gauge cluster was disassembled and all lights were replaced with white LEDs. The additional custom gauge cluster for the transmission cooler was added to the dash panel and the remaining interior lights were replaced with blue LEDs. The factory 6disc CD changer and 6 speaker stereo system is still in place.